Mansfeldia Comitatus Auctore Tilemanno Stella Sig. 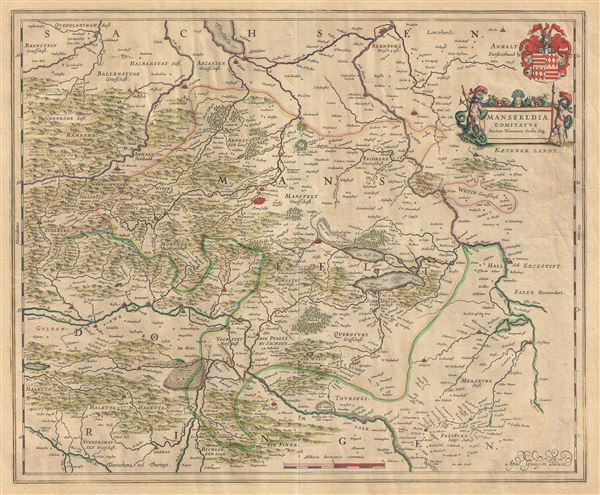 This beautiful 1655 map by Willem Blaeu represents Mansfeld and its surrounding regions, located in the western part of eastern Germany. Centered on Mansfeld, the map covers from Bernburg south as far as Kindelbruck, and from Stolberg eastward to Halle. Important cities and towns, including Berga, Frankenhausen, Kelbra, Alsleben, Aschersleben, and others are identified. Forests, marshes, rivers, lakes, towns, cities and mountains are beautifully rendered. A title cartouche in the upper right quadrant details two cherubs dressed as knights, one of which is fighting a dragon. The Mansfeld coat of arms is also included above the title. This map was created by Tilemanno Stella, known for his maps of the Holy Land and Germany. Martin Luther, the pioneer of the Protestant Reformation, lived and grew up in Mansfeld between 1488 and 1496. This map was issued by Willem Blaeu in 1655. Very good. Minor wear along original centerfold. Text on verso. Overall toning.